It sits on the facility reception desk, blinking bright purple as I approach, but somehow escapes my initial notice. After all, I have so very many things — urgent things, funny things, deeply profound things, I’m sure — that desperately need to be shared with that person wearing the headset. So I just start speaking, fast and furious, with a “Goodmorning,howareyou?Iwaswonderingif…,” until three sentences in I finally see the flashing “Hey, can’t you see I’m on the phone, shut up, you idiot!” light. That’s when the words crash together in my throat, stifled into silence in a gruesome epiglottal pile-up. The blinking electronic stop talking sign eventually does its job, communicating that the receptionist is already on a call, and I should patiently wait my turn. 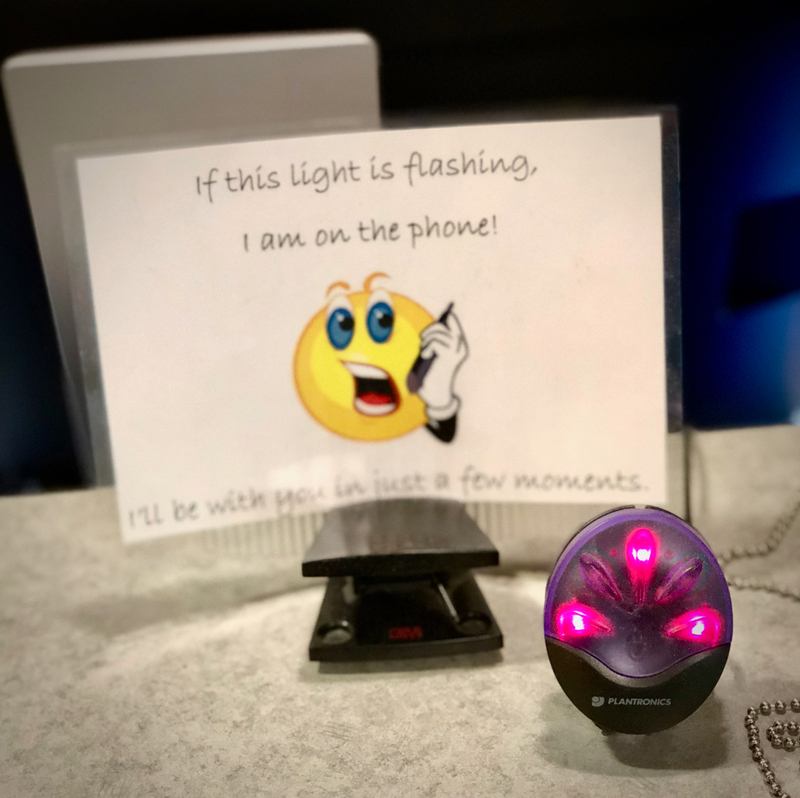 As I stand there obediently and quietly, I realize just how impressive this technology is, and how much I want and need a bright purple flashing light of my very own — not just for my phone calls, but for my whole life. Ideally, it would be mounted squarely in the middle of my forehead and I’d have the clicker in my pocket, giving me the ability to instantly tell anyone in any circumstance at any time that I’m doing a very important something or other and shouldn’t be bothered right now. For example, if I’m a director of nursing and sense a member of my team wants to vent a concern, I activate the “I’m busy” light to delay or avoid that confrontation entirely. If I’m an administrator and a grumpy family member approaches in the hallway, I hit the button and hurry past. If I’m in admissions and a tour walks in, I hit the button. If someone wants to talk to me about my obsessive and inappropriate use of the button, I just hit the button. Not only would this functionality revolutionize the long-term care workplace, but it would transform marriages and family interactions as well. No more unwanted communication or expectations. Just hit the button and make yourself unavailable. The flashing purple light leaves no room for argument or nuance. When it’s blinking — they must obey. Most of us, of course, don’t really need this actual technology. I know I don’t. We’re busy, harried, modern humans, so we have the same functionality built right in. We’re able to communicate “don’t bother me” with an annoyed look, a tired lift of the eyes, an exasperated sigh, an edge in the voice, or with closed and dismissive body language. We do it all the time, and for often defensible reasons. There are so many opportunities in life and work to disengage and create distance between ourselves and others, so many appealing justifications to do so, so many ways to stay separate, removed and safe behind the blinking light. But thankfully, there’s one good reason not to — the relentless passage of time.